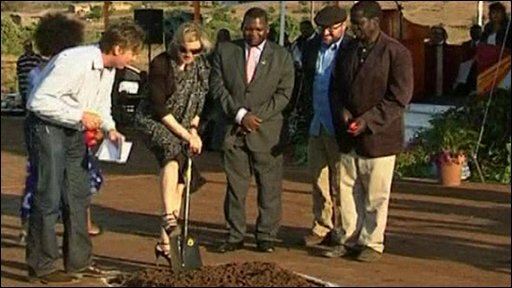 Pop star Madonna has marked the start of construction at the girls school she is building in Malawi. The 51-year-old cut a ribbon and planted a tree at the groundbreaking ceremony at the Raising Malawi Academy for Girls. The star's four children including David, 4, and Mercy, 3 - whom Madonna adopted from the country - were also present at the event. It is thought construction of the $15m (£9.2m) academy will take two years. "Growing up in a privileged life, I took education for granted, but coming to Malawi has taught me a lot of things and learnt to appreciate what life gives," Madonna said. The singer added she wanted to give opportunities to underprivileged young girls. "I realised how much they deserve to be educated and so for me the best thing I could do was to build a school, a unique school that will create future female leaders, scientists, lawyers and doctors. "If this school is successful it will be used as a model to replicate it in other countries," she said. Madonna's charity, Raising Malawi, aims to provide accommodation, food, education and other support to orphans in the country. The Raising Malawi Academy for Girls, is on the outskirts of the country's capital, Lilongwe and will admit 500 girls from the small southern African country's 28 districts. "Research proves that young girls throughout the developing world are often left without opportunities to receive a comprehensive education and the benefits that education can provide," Madonna said in a statement on her website. "Our goal is to teach them to challenge themselves, serve their local communities and develop their country." Anjimile Mtila Oponyo, a local academic who has been hired to head the academy, said:"Madonna believes that given opportunities, these girls will become scientists, lawyers and doctors." "She believes in them. Having someone believe in you is important to a girl." During her trip, Madonna is also expected to meet with President Bingu wa Mutharika and visit some of the orphanages her charity supports.